Mel Rapton Collision Repair will perform a FREE preliminary inspection of your vehicle to determine the approximate costs and initial estimates for repairs needed. We specialize in Honda repair but our fully equipped collision center can handle your auto body repair needs no matter what make or model. We operate closely with insurance companies to ensure that your vehicle returns to a like-new state quickly. The paint shop works tirelessly to match all colors and trims, yielding a factory-quality finish. From a mild fender bender to a more serious car crash, no one likes a car accident. Allow our trained professionals to complete your automobile restoration to manufacturer-specified standards. So if that unexpected fender bender ever happens to you, the Mel Rapton Collision Center stands ready to help take the hassle out of getting you back on the road again. 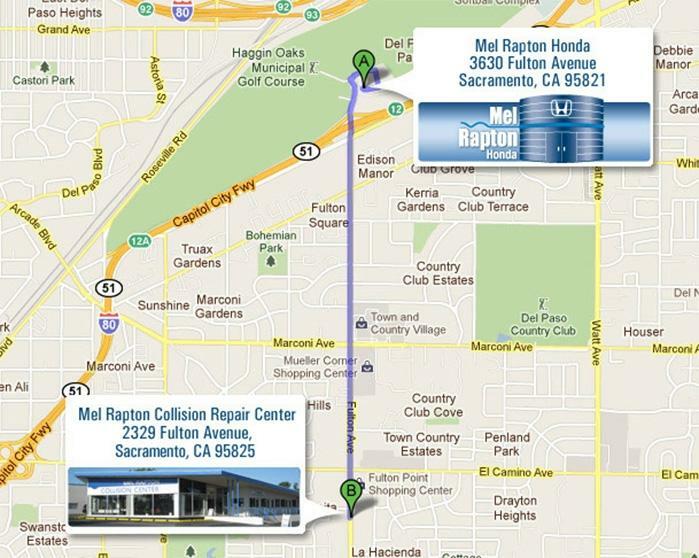 The Greater Sacramento Area’s leading car repair service. For quality–conscious consumers, Mel Rapton Collision Repair is the auto body shop in Greater Sacramento Area that provides peace of mind. Mel Rapton Collision Repair works with all insurance companies and guides you through the repair process. We work directly with your insurance representative to facilitate a fast, high–quality, stress–free repair. With our Car-O-Liner frame rack and Cartronics computerized measuring system we can accurately and safely align your vehicle's frame to manufacturer specifications. Mel Rapton Collision Repair painters are expertly trained to use our high–tech, industry–leading paint–mixing system. Using only the finest paint from DuPont, our technicians use Global Finishing Solutions (GFS), the world’s leading paint booth manufacturer, to bake your vehicle’s finish. This booth, in comparison to traditional paint methods, creates more durable finishes with unsurpassed beauty and faster finishing times. Mel Rapton Collision Repair provides an interior-exterior clean and wash on every vehicle repaired to return your vehicle back to you in spotless condition. Hertz and Enterprise Rent–A–Car have an office within a short distance from our location and Mel Rapton Collision Repair works with both Hertz and Enterprise to make your rental experience effortless. Insist on award-winning service.